1. Why are so many restaurant wine lists so overpriced, pretentious and unintelligible? A. Well, that’s like asking why people want to know what Paris Hilton did last night. It doesn’t make sense except to those to whom it…seems perfectly natural. Frankly, some of this is just driven by greed. It does cost quite a lot of money to build and maintain a wine cellar, and in return it can be a source of profit. Whether or not it is a source of profit, and whether or not the list is “friendly” to the restaurant’s menu and its patrons is the issue here. Some restaurateurs believe that they can break even or perhaps lose money on food but make their profit on wine. Others believe that in order to have cache, they’ve got to have a list with “big” expensive wines – top-tier Burgundies and Bordeaux, and high-end California Cabs and Chardonnays. This school of thought caters to people who have a lot of disposable cash, are showy, and who believe that if a “good” wine lists at $100, a $300 wine is 3X as good. They also tend to believe that the wine list makes the restaurant rather than the food, and that potential patrons will assume the food is top-notch if the wine list is overpriced. Much of it, though, is just laziness. It takes a lot of thought, effort and research to develop a list that complements the menu, is diverse, interesting, affordable and available. It’s simply easier to skim the top lists on Wine Spectator and offer up all high-end wines at super-premium prices. Do us all a favor, and don’t patronize these places. 2. A good friend who likes wine invited me over the other night. She brought out several kinds of wine glasses and insisted that all these different glasses are essential to enjoying different wines. Is she just showing off and full of #$%&*? Well, she’s not necessarily full of #$%&* but she’s certainly had a whiff of it. By coincidence, I drank some rose last night out of a Riedel (“ree-dle” not “ry-dell”) glass that I received as a gift at a wine dinner. For sure, Riedels are very, very nice glasses: very thin lead crystal created to precise measurements, and they have virtually no lip which some say makes for better contact with the mouth and therefore more appreciation of the wine inside. Riedel and other fine glassware makers offer different glasses for burgundies, Bordeaux/cabs, sparkling wines, young whites, older whites, dessert wines and ports – and will tell you you’ve gotta have them all. You don’t. Most of the time, I use a 12.5 ounce tasting glass with a slight “tulip” taper for all my wines except sparking and ports. They’ve got logos on them and the logo sandblasting process requires a bit thicker glass; they also have a noticeable lip but I don’t think that gives any less enjoyment. I only fill them about 1/3 full so that guests can swirl and so that they can get their noses in ’em to draw in the aromas. On occasion, I do use glasses with a fuller, rounder bowl when I have an especially aromatic red but it’s not a show stopper for me, and it shouldn’t be for you. 3. Is a “Reserve” wine better, and should it cost more? A. “Reserve” means nothing, Mr. Blutarsky: zero-point-zero, at least in the US. It is, however, a fairly effective marketing gimmick, because people think it means “better” and therefore “reserve” wines sometimes cost more. That doesn’t mean that a reserve wine can’t be any good, but since the term is not regulated by anybody, it’s typically nothing special. I wouldn’t put any stock in it; instead, ask your wine retailer or go online and check out a particular wine if you’re interested. 4. I just bought an excellent Zin, and the bottle says “Old Vine.” So how old is “old”? A. Who knows? Could be from 20 year old plants, which aren’t terribly old, but it also could be from 80 or 100 year old vines, which really are pretty ancient in vine terms. Like “Reserve”, “Old Vine” is more a clever marketing tool than anything else. A. Well, it’s a blend – either white OR red – that is supposed to be similar in style to the great wines of Bordeaux. It is pronounced to rhyme with “heritage,” although I often say it the French way myself (Mare-it-tahj) out of habit. 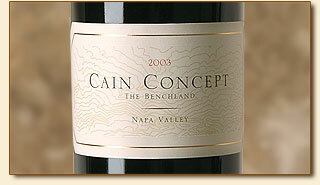 The name came from a contest in the late 1980s to promote these California blends. Wineries that put Meritage on their label have to pay a fee per case to the Meritage Association, and wines must be made from specific grapes – Red Meritages have two or more of Cabernet Sauvignon, Merlot, Cabernet Franc, Malbec, Petit Verdot, St. Macaire, Gros Verdot and Carmenere, and no one variety can be more than 90 percent of the blend. White Meritage is made from a blend of Sauvignon Blanc, Semillon and Sauvignon Vert. There are some very good Meritages out there, but in my view few of them have any resemblance to their French cousins. Variety is good! 6. I ordered a bottle of Zinfandel the other day, and when it was brought to the table, I sent it back because I thought I had ordered a white wine. What gives? A. Where do I begin? Zinfandel is a red grape, to be sure, and considered California’s own native grape, although plant DNA experts say it is actually a clone of the Croatian Crljenak Kastelanski grape, a descendant of which was also grown in Italy (and still is) as the Primitivo grape. I digress. Anyway, as for the white version, legend has it that the Sutter Home Winery in Napa experienced a stuck fermentation – where the yeast stops turning sugar into alcohol – of a large batch of red Zinfandel in 1975. Not knowing quite what to do, the winemaker drained the pinkish juice off the skins and placed it in a separate tank. What resulted was a so-called “blush” wine with quite a bit (relatively speaking) of residual sugar and lacking the tannin, color or structure that you’d get with a lots of skin contact and a full fermentation. White Zinfandel found an audience, mainly in the USA, and it is now one of the largest-selling wines in the world. However, there are also a number of good, dry rose wines made from 100% Zinfandel, and Sutter Home itself made a dry rose from Zinfandel a couple years before the sweet one. It’s simply a matter of the degree to which the winemaker ferments the sugar out of the juice, and how much skin contact he or she allows. Some people love this stuff. Go figure. 7. Why does wine typically cost more, sometimes a lot more, than even high-end beers or top-shelf liquors? The first is simply that wine costs a lot more to make than beer or distilled spirits. For example, the cost of good wine bottles, corks, and foil capsules to close the end of the bottle alone can be $1.50 or more per bottle. Smaller wineries that don’t own their own bottling line will also pay about $2 per case for that process. Putting that in beer terms, the cost of producing a six-pack of beer would be $10.50, PLUS the cost of the beer (not included) and considerable markups for the wholesaler and your local carry-out. Maybe we’re talking around $22-25 for a six-pack of suds, all in, when you go to buy it. Growing and harvesting grapes is an enormously expensive exercise, complicated by the fact that, other than “Two-Buck Chuck”-type bulk wines, most are made and marketed using particular grapes grown in specific regions and vineyards. So, if they have a bad year, they cannot simply substitute other fruit. Contrast that with a mound of wheat and a bag of hops that is mostly “generic” and can come from just about anywhere. Winemaking is also very labor-intensive, much more so than brewing or distilling and hand-harvesting is the order of the day in vineyards whose grapes go into the best wines. And the capital cost of opening a winery and staying current with equipment and technology is astronomical. For example, oak wine barrels cost $500-$1200 each and are good for about three years, five on the high end, and must be cleaned, sterilized and re-toasted between vintages. The second reason is that most wine is sold under what is called the three-tier system involving the winery, wholesaler, and retailer. Ironically, the winery tends to make the smallest margin among the three, and the retailer, the largest. An article in the January 2007 issue of Wines and Vines illustrates: Start with the winery’s production cost, of, say $5.00 a bottle. 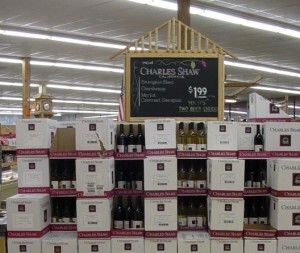 Add $2.00 per bottle for overhead, and only $1.00 a bottle markup (margin). The cost, then, to the distributor or wholesaler is $8.00, which is then marked up 30% TO $10.40. Off the wine goes to the retailer, where a 50% markup is added, and you have a consumer cost of $15.60, not including tax. And if the retailer is a restaurant, you can expect a markup much higher, up to 200% on top of the retail price. As Paul Harvey says, “now you know the rest…of the story. 8. 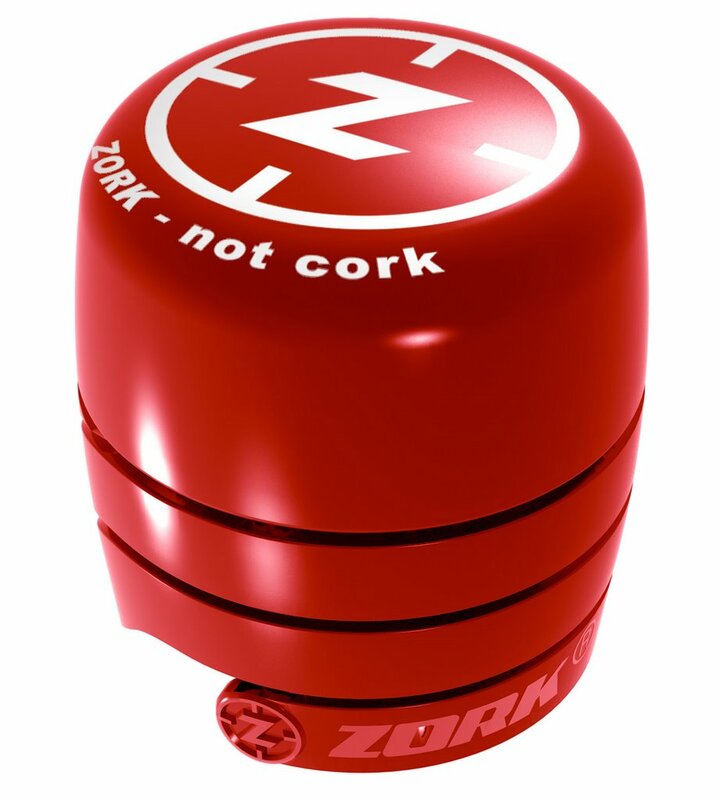 Are screw caps an indication of cheap or lousy wine? 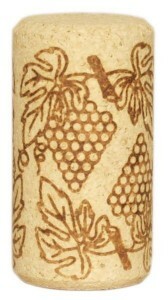 Are they as good as real cork? Will real corks disappear? Well, that’s three questions, and here are three answers: no; sometimes yes, but under certain circumstances; and no way, Jose. Screw caps, sometimes called Stelvin closures (the name of the original manufacturer) can be found today on $125 bottles of Plumpjack Reserve Cabernet Sauvignon. So they are certainly not an indication of cheap or poor wine by any means. 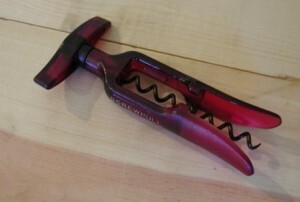 However, there is a broad difference of opinion about how they are best used, and some lower-quality wines do come to the consumer with screw caps. Many winemakers believe that screw caps work best with highly-acidic wines that are meant to be drunk soon, within perhaps a year or two at most. For these and other reasons, screw caps are very popular in New Zealand, where an estimated 75% of all wine is produced with them including virtually every bottle of Sauvignon Blanc. And I’d guess that the majority of screw cap wines are found on low- to mid-priced white varietals. At the same time, a lot of new-world red wines are also drinkable right from the winery, and as a result more of them are coming off the bottling line with twist-offs. In fact, I just opened a Chilean Petit Verdot with a screw-cap. Altec closure made from cork “flour” (cork particles with the lignin removed) and a binder that looks almost identical to a natural cork. Zork, a strange and futuristic looking contraption from Australia. My view? Natural cork is not going away, despite the evidence that 3-5% of all wines that are stoppered with it become infected with TCA. Remember that there’s a significant and historical deference to tradition in winemaking, so natural corks, actually the bark of the cork oak tree, will stay with us for a long time. And scientists are making great strides in controlling TCA while maintaining the properties that make cork such a great seal. Of course, when you open an expensive bottle of wine and you’re hit with the overwhelming smell of wet newspaper, all that tradition quickly amounts to zilch-point-zero. Synthetic stoppers made from plastic just don’t seal well enough for wines that age long-term in the bottle. They’re ok for wines meant to be drunk within a year, or two at most. 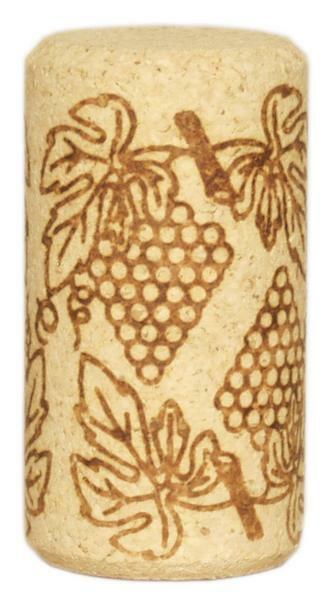 Screwcaps are proving themselves, by far, the best alternative to natural cork. There is no risk of cork taint, and the evidence is that screwcaps, especially those with a tinfoil liner, show the most promise for long-term aging in the bottle. 9. I drink a lot of wine and would like to buy inexpensive stuff like Two-Buck Chuck. At that price can it be any good? A. Depends on what you mean by “good.” These wines are inexpensive mainly because they come from extremely high-yield vineyards; the grapes are machine harvested, rarely sorted for quality, fermented in huge quantities and the resulting wine is pushed into the market with little aging – and no advertising or marketing. The second major source of bulk wine is high-end wineries. How’s that? Well, more frequently than you might imagine, something happens at a winery that renders a batch of wine unsuitable for bottling under its own prestige label. But the wine is still good enough to be sold on the bulk market, and helps the original winery recover some of its costs. The real conundrum when buying bulk wine, sometimes available for as little as $2-4 a bottle, is that the quality and taste can be wildly inconsistent. I’ve heard about but never seen people opening a bottle from a case of bulk wine in the parking lot, and if it’s palatable, running back into the store to buy the rest of the case. And I have seen people at home opening bottle after bottle of bulk wine from a case, and finding each and very bottle just awful. So it is sometimes a gamble, but in the days of strict quality control and high production standards, the case disaster is rare. Bulk wine is a step above so-called jug wines that often have names like “Hearty Burgundy,” but aren’t made from French-grown Pinot Noir, or “Chablis”, and aren’t made from French Chardonnay. Usually the labels don’t say what’s in them, so your guess is as good as mine. These I wouldn’t touch with a barge pole unless I was broke and in college. And I’m not…in college. 10. I went online the other day to buy some wine directly from a winery that I like, and they can’t ship to NJ. Why is that…and how do I know which wineries and retailers can ship to which states? I thought that the US Supreme Court fixed this problem awhile ago. The May 16, 2005 U.S. Supreme Court decision was very specific: The court ruled that any state that allows a winery within that state to sell directly to its residents must allow wineries outside to sell to its residents as well. Lots of consumers in many states thought that this would make it possible – and easy – for them to purchase directly from wineries in any state. Not so fast. What actually happened is some states moved to block all direct-to-consumer deliveries, many on the specious pretext that minors were buying wine from the Internet and having it delivered when their parents aren’t home. Others have leveled the playing field, and still others are mired in legislative battles over such deliveries. Some wineries have opted to do what it takes to play in states where it’s legal, and where they also believe they can get enough business to make it worthwhile. But many small wineries just can’t sell enough to afford the registrations, fees and taxes that many individual states are demanding. In addressing the issue in New Jersey, State Assemblyman Patrick Diegnan says he will soon introduce legislation that allows out-of-state wineries to ship directly to NJ consumers “under certain conditions.” Let’s see what happens and what those conditions are. You can see your state’s current shipping policy on this map. 11. What’s the difference between a variety and a varietal? A. The variety is the type of grape; the varietal is the wine made from that grape. Of course, lots of wines are made as a blend of several grape varieties and so are given a proprietary, made-up name. For example, Cain Concept is a fabulous blend of four of the great Bordeaux grapes. 12. I am allergic to sulfites and as a result, if I drink wine I get a wicked headache. Are there any wines made without them? A. I have sorta bad news, a dose of reality, and good news for you. The sorta bad news is that all wine contains sulfites, even those to which it’s not added; it’s a byproduct of the fermentation process. Your own body makes the stuff, too. Sulfur Dioxide or SO2 is an important protective element in winemaking, and a lot of wine made without it often spoils quickly, or turns prematurely brown (for white wine) or brick (for reds), and tastes like crap. The dose of reality is that your headache is more likely from the fact that you drank an entire bottle of wine, chasing a Cosmopolitan, two Amstel Lights and a lemon drop shot. And as an aside, if you eat dried fruit or other foods that are preserved similarly, you are getting several to hundreds of times as much sulfite as in a glass of wine. If those apricots or raisins don’t kick in your headache, the wine won’t either. The good news is that there are probably fewer sulfites in wine that you think, and much less than can cause an allergic reaction that’s ever been clinically verified. In other words, it’s a myth. And in any event, food allergies provoke serious reactions, which are immune responses to an allergen. So you’re probably not suffering from an allergic reaction to wine unless you end up in the E.R. The one exception is that if you’re asthmatic, it could be a problem – consult your doctor. For the rest of us, all things in moderation! 13. 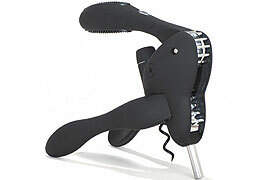 There are so many corkscrews on the market. Which is best? A. Ah, so many bottles to open, so little…liver. My favorite is the “waiter’s friend” that I keep in my car, and often in my pocket. Simple and elegant, and the quality ones make opening your bottle a snap. 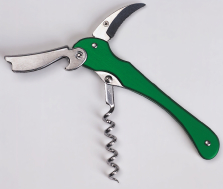 They typically have an attached knife or foilcutter, and once you learn to place the “worm” properly on the cork and use the lever, your corks will come out cleanly and flawlessly with little effort. It looks elegant and makes you look like a pro. My runner-up is the simple Screwpull table model. Even easier to use than the waiter’s friend, although less elegant, and with very tight corks it can take some effort. Just place the two “prongs” securely over the bottle, hold them together, and as you turn the worm, the cork is automatically pulled out of the bottle like…magic! 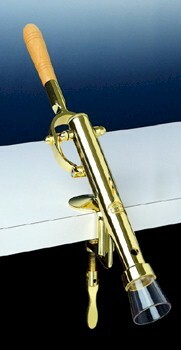 For serious business at home, I use this lever-arm model but mine’s chrome. 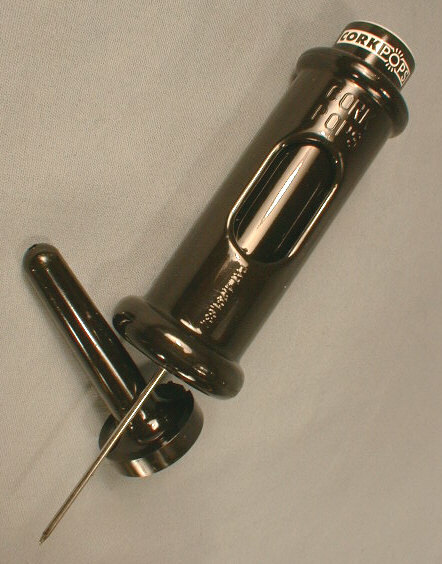 You just place the neck of the bottle tightly into the plastic sleeve, bring the handle down and back up, and the cork is extracted swiftly from the bottle and it pops out of a “chute” underneath the device. Looks cool and you can open a case in two minutes! This one looks cool, too, but it’s not really very handy. Most people have to keep it in the presentation box because it’s so big it won’t fit neatly in your bar drawer…or any drawer. It’s also unwieldy, and when the worm gets dull, the powerful action will often force the cork down into the bottle as a geyser of wine shoots up with great force and random direction. I’ve seen more than a few hosts and hostesses embarrassingly coat themselves and their guests with wine using these things. Did it to myself once too, wearing a $%&#@* white linen jacket…boy, THAT looked great. Not. Rabbits range in price from about $15 to more than $150 and the quality varies widely from decent to crappy; I’ve seen $100 ones fall apart. You’ll see lots of these. They are cheap, the “arms” often fall off when the metal pins break, and notice that they use an augur and not a real “worm”. The result is that they often bore through the cork, either chewing it up or failing to get a good hold on it, and then you pull and pull…and get nothing. Forget this thing. 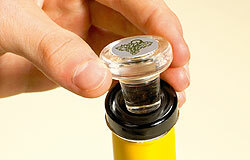 Sounds like a great idea: Shoot some C02 into the little space between the cork and the wine. Since the wine can’t be compressed, the C02 will push the cork out. Sometimes it works and sometimes you guess wrong and make a mess. It’s not elegant and it’s totally unnecessary: if you are going to drink wine, you can put in a little effort, can’t you? 14. I saw what looked like tiny shards of glass in a bottle of Chardonnay. I didn’t buy it and how can wineries get away with that? I don’t think it was sediment because it was a 2005 wine. A. Those were harmless crystals of tartrate. Some wineries do what’s called “cold-stablize” the wine to get those out before bottling, but others don’t. If it bothers you, choose another wine, but you might be missing a good thing. 15. How much of a grape does a wine have to have to be called by that grape’s name? What are other labeling requirements? In the U.S., a wine must have 75% of more of a particular grape to take its name. For example, a wine labeled Cabernet Sauvignon must be at least 75% Cab, but the rest can be virtually anything. The exception is Oregon, where a varietal must have 90% or more of the named grape variety. On the labels of wine made in the U.S., the region and the winery also appear. If the wine is labeled with an American Viticulture Area, then 85% of the grapes must come that AVA, and the same percent is required if a county is named. That’s why Charles Shaw (“Two-Buck Chuck”) no longer puts “Napa” on his wines that don’t actually have a great majority of Napa-grown grapes in them. But that still means that a “Napa” wine could have 15% of its grapes grown in Washington, Oregon, or elsewhere. Other regulations put an interesting (hmm) twist on wine labeling. One is that U.S. wineries can blend up to to 25% of non-U.S. wine and still label the final product “American.” The French will love that. And a vintage of, say, 2005 can have up to 15% of non-vintage wine (from a different year) and yet be labeled an ’05 as long as it doesn’t have an AVA designation. We live in…interesting times, wine-wise.